Reviewing an assignment writing website requires attention to details like accuracy, speed, quality, privacy, guarantees, support and more. Proassignment is one of the better sites out there, but it’s harder to navigate than some of the others and the pages are long and mean a lot of scrolling up and down. One of the best things about the site is the clearly stated policies, which are easy to find and simple to read so that students know what to expect before they order. This transparency makes the site reliable and trustworthy and one that students can feel comfortable using. The paper we ordered from Pro Assignment turned out pretty well. It is sure to get a good grade for most university courses. The details were there, and the writer has a good grasp of the English language. There wasn’t a lot of creativity, but we were happy with the finished product. Ordering any of these assignments is straight foward on the website and there are quite a few subjects and topics to choose from. All in all, you can get a pretty good paper from Proassignment if you’re not all that interested in going above and beyond, but simply getting it done. The pricing page is a bit frustrating as you have to make selections from the various drop-down menus to get a quote. There isn’t a chart or grid like other sites offer. When you choose the assignment, deadline and length, you get a range of prices that give you an idea of what you’re going to pay. There also two quality levels to choose from: standard and premium. For example, a one page essay with a deadline of 10 costs between £9.09 and £10.49. A deadline of 24 hours for the same standard paper costs between £17.49 and £18.89. Prices go up for longer papers. The prices look a little strange with their odd pence values which can make one assume that they have simply been converted from dollar values – Uk students choosing a UK site who need assurance of a UK service can be put off by such realisations. The site doesn’t have a specific page that outlines a discount policy. Unlike other sites, it doesn’t appear that loyal or repeat customers are entitled to any type of savings. Likewise, first time users or those ordering more than one assignment aren’t able to take advantage of any type of discounts. The site would probably attract more customers if they offered such discounts. We would have like to save money on a longer paper or by ordering more than one assignment. The site makes it easy to order. Once you decide what the length and deadline are, you can give further instructions regarding the final paper. 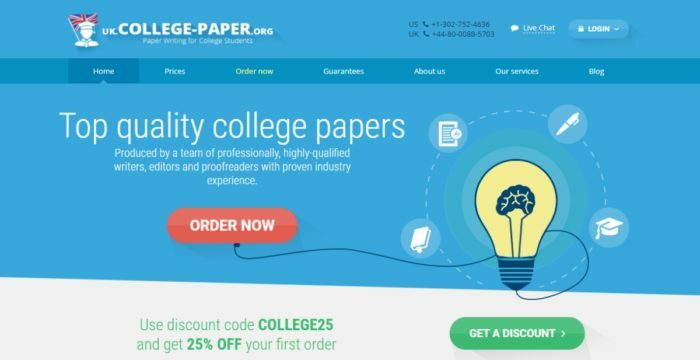 The site offers live 24/7 support and free revisions for any paper. Students can also take advantage of a free plagiarism check, Master’s and Ph.D. level writers and a deadline guarantee. Overall, this site is reliable and quick, but their site isn’t super-appealing, and it is a struggle to get an exact price.